Try this Low-Carb Pepperoni Pizza Chicken Bake when you need some low-carb and gluten-free comfort food! This is a dinner the whole family will enjoy and it’s also low-glycemic, and can be South Beach Diet Friendly; use the Diet-Type Index to find more recipes like this one. Click here to PIN this Low-Carb Pepperoni Pizza Chicken Bake! Watch the video to see if you might like to make Low-Carb Pepperoni Pizza Chicken Bake! I made this a couple of times with my nephew Jake to get it just right. The first time we didn’t reduce the pizza sauce and the dish was too watery. We also tried it first with turkey pepperoni, which was fine if that’s what you prefer, but this recipe doesn’t take a lot of pepperoni and the full-fat pepperoni definitely crisped up a lot better. (It also adds more fat to the dish, but most of that fat is left in the bottom of the dish; if that’s an issue for you I’d go with the turkey pepperoni. )You can use part-skim or full-fat Mozzarella Mozzarella, either will be good. If you have family members who love pizza and others who need to limit carbs (whatever the reason), I promise this is going to be a hit! 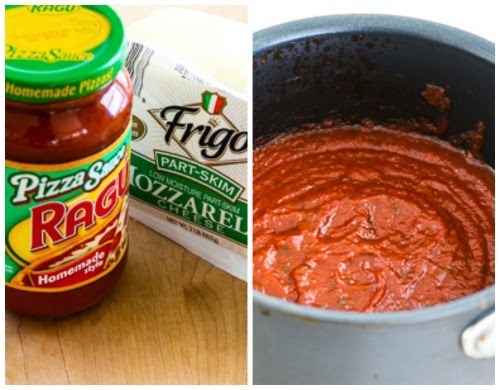 You can make your own pizza sauce if you want even less carbs, but I checked labels at the store carefully and found this sauce that only had 18 carbs for the whole jar, so I used that. Don’t skip the step of simmering the sauce on low until it’s reduced to one cup. Layer the chicken pieces in a glass casserole dish that’s barely big enough to fit the chicken. Spread each piece with a generous amount of the reduced sauce. Put a thin slice of Mozzarella and few slices of pepperoni on each chicken breast. Bake at 400F/200C for 25-30 minutes, or until the cheese is melted and starting to slightly brown. Serve hot and wait for compliments. I promise this will be popular with all the pizza fans in the family! If you’re reheating leftovers, I recommend you cover the dish to keep the chicken from drying out. 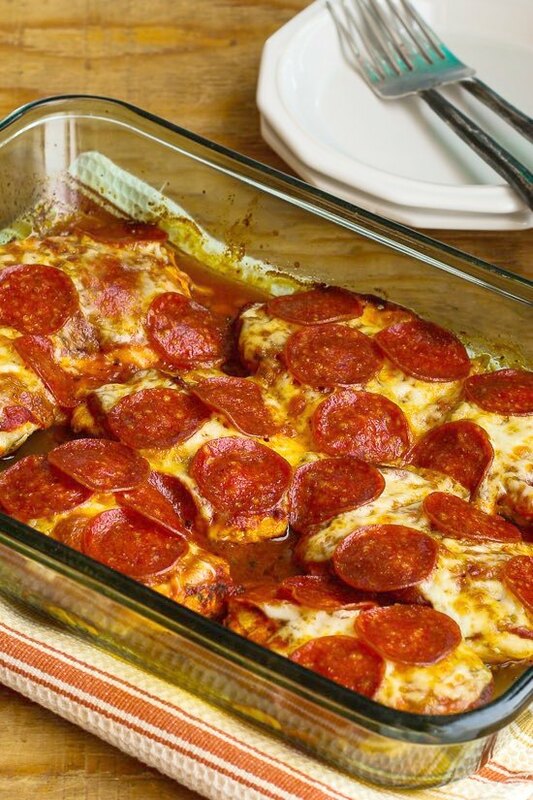 Try this Low-Carb Pepperoni Pizza Chicken Bake when you need some low-carb and gluten-free comfort food! Preheat oven to 400F/200C. Put the pizza sauce in a small saucepan and simmer over low heat until it’s reduced to one cup, about 20 minutes. Don’t skip this step or the dish will be watery. While the sauce reduces, trim the chicken breasts and cut each one crosswise to make two same-size pieces. 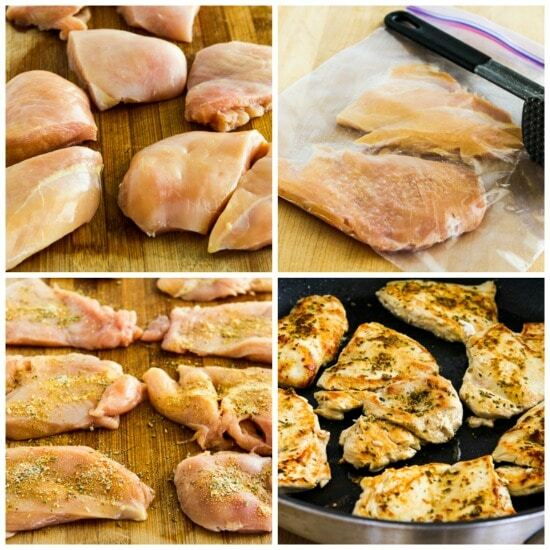 Put chicken pieces one at a time inside a heavy plastic bag and use a meat mallet (or something heavy) to pound the chicken until it’s as thin as you can get it without it shredding apart. (Don’t worry if some pieces break apart a little.) Mix the Greek oregano and garlic powder in a little bowl and then sprinkle both sides of each piece of chicken with the mixture. Heat the olive oil over medium-high heat in the largest non-stick frying pan you have (you may have to do this in 2 batches if your pan isn’t big enough.) Add the chicken pieces and cook 1-2 minutes on each side, just long enough to brown the chicken but not long enough to cook it through. Choose the smallest glass casserole dish you have that will fit all the browned chicken pieces, and lay the chicken in the dish in a single layer. Cut the Mozzarella into slices and cut the slices as needed to make enough pieces to mostly cover the top of each piece of chicken. By now the sauce should be nicely reduced, so spread sauce over the top of each chicken breast. (Use it all.) 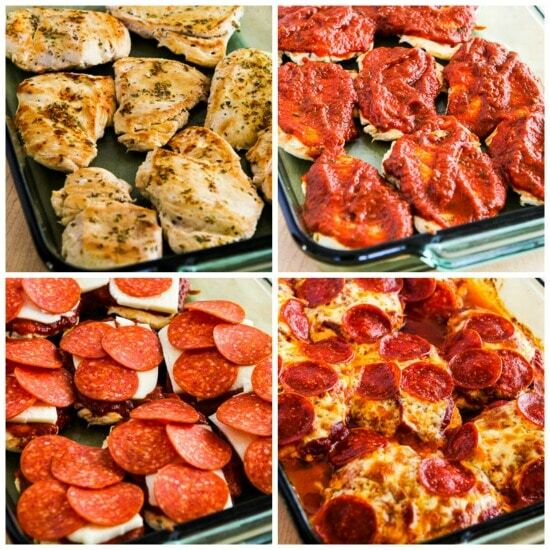 Top each piece with sliced Mozzarella and pepperoni slices, covering the top of each piece of chicken as much as you can. Bake uncovered about 25-30 minutes, or until the cheese is melted and starting to brown and the pepperoni is slightly crisped. (Some pieces of pepperoni will slice off the chicken, try not to obsess about that like I did.) Serve hot. This was great reheated in the microwave for a few minutes, although you might not have any left! Use the lowest-carb pizza sauce you can find or make your own pizza sauce to keep the carbs low for this recipe. 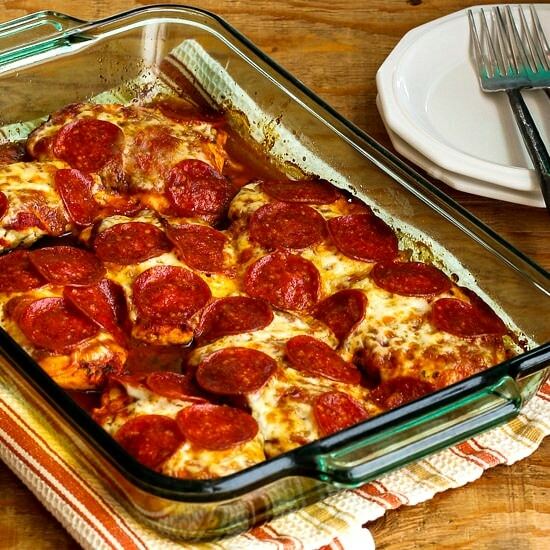 This Low-Carb Pepperoni Pizza Chicken Bake with full-fat cheese and pepperoni should be great for traditional low-carb and Keto eating plans if you’re careful to choose low-carb pizza sauce (or make your own). You could use skim-milk Mozzarella and turkey pepperoni for the South Beach Diet. We definitely liked it best with full-fat pepperoni, but quite a bit of the fat is left in the dish. Use the Diet Type photo index pages to find more recipes suitable for a specific eating plan. You might also like to Follow Kalyn’s Kitchen on Pinterest to see all the good recipes I’m sharing there.